You can use this Guide (PDF) to learn more about how to use this website. What is the purpose of the eBenchbook project? The Election Law Program, a joint venture of William & Mary Law School and the National Center for State Courts, formulated the eBenchbook project to alleviate concerns accompanying the contemporary surge in election litigation. Each state-specific election law “eBenchbook” is intended as a comprehensive and freely-accessible online resource for judges, legal professionals, and members of the public seeking to better grasp the intersection of law and elections. Who created this site and its content? The Election Law Program, a joint venture of William & Mary Law School and the National Center for State Courts, initiated the eBenchbook project through generous funding provided by the Democracy Fund and the Rockefeller Brothers Fund. Students at William & Mary Law School were responsible for uploading and curating much of the site’s content. Under the guidance of our state committees and Election Law Program staff, law students drafted statutory overviews, added supplementary materials, assigned statutes to election law topics, and generally facilitated the site’s development. 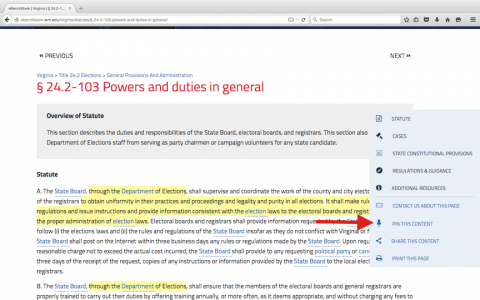 Additionally, the election professionals on our state committees contributed annotations to statutory text with the aim of illuminating the election code’s practical workings. Committee members also provided guidance in the selection of materials for inclusion on the site and the organization of code sections under election topics. 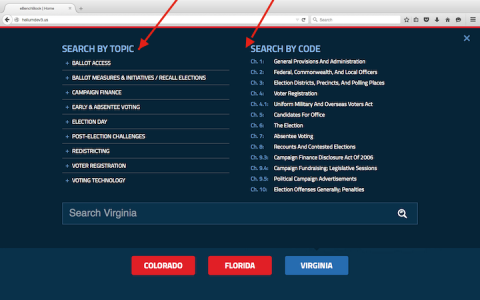 How do I browse the election codes on the site? Once a state is selected, visitors have the option of exploring the election code either by election code chapter or election law topic. Additionally, visitors may use the “Search” function to locate a particular statute. 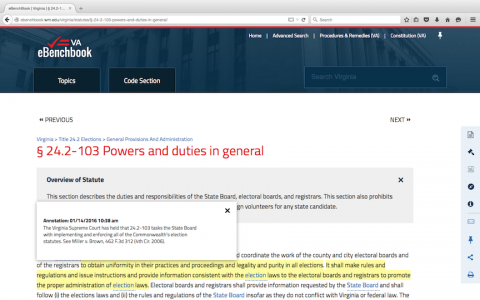 If choosing to Search by Code, visitors can navigate the statutes by chapter as they are organized in the official election code. 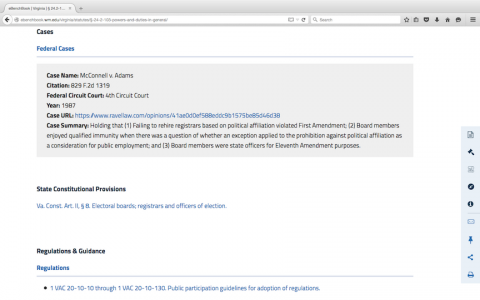 Alternatively, selecting an election topic on the Search by Topic menu reveals a listing of statutes related to that subject. Visitors can further narrow their search by selecting a subtopic listed beneath the general topic. What content is available for a statute? When a statute is selected, visitors are presented with the complete statutory text as it appears in the state code. Some statutes also offer overviews, which paraphrase and summarize the code section’s contents. If applicable, supplementary materials related to the code section are accessible through the flyout menu on the right side of the page (or simply by scrolling down the page). What supplementary materials are available for a statute? Supplementary materials listed under the statutes include relevant case law; constitutional provisions; regulations; attorney general guidance; and other materials related to the particular code section. Where available, links to complete versions of the resources are provided. What is the highlighted statutory text? If statutory text is highlighted in yellow, it indicates that an annotation was added to it by one of our election law committee members. If you click the highlighted text, the annotation will appear. The content of the annotations is wide-ranging, but they all are intended to provide commentary and insight on the law’s meaning and operation beyond the statutory text. What does it mean if statutory text is underlined? If a word or phrase within the statutory text is underlined in blue, it indicates a term defined in the election code. Clicking the underlined word will reveal the term’s statutory definition. Can I save a statute if I want to view it later? Yes. Through the flyout menu available on the right side of each statute, visitors have the ability to “Pin” individual statutes in order to access them later. Any previously pinned content is accessible through the “Pin” icon at the top right corner of the page. Pinning is especially useful for cross-referencing and comparing statutes from different code chapters or different states. What are the Procedure & Remedies Tutorials? The Procedure & Remedies Tutorials, accessed at the top right corner of the page, are specific to each state. These guides provide an overview of state specific election litigation procedures where they are outlined in the code.The tutorials also cover certain varieties of federal election claims. No, the eBenchbooks are a nonpartisan resource. 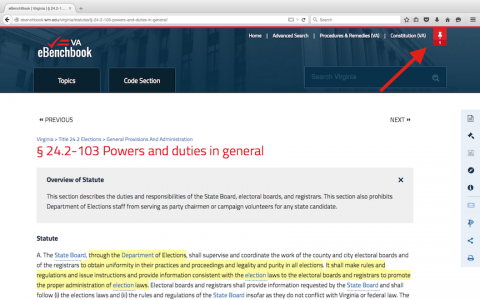 Site content was designed to explain the operation of election codes while simultaneously avoiding the expression of policy preferences or political inclinations. 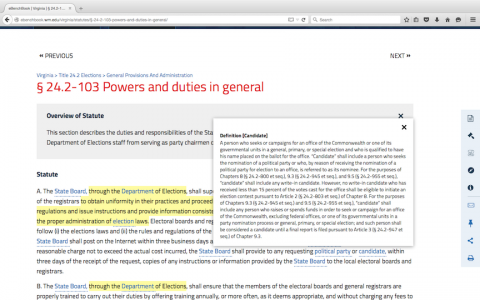 Our bipartisan state committees consist of election professionals affiliated with both major political parties, and the content of their annotations is intentionally apolitical. How can I contribute to the eBenchbook site? A major goal of the eBenchbook project is to engage election law communities in covered states by expanding the number of election experts capable of contributing to the site. If you are an attorney, judge, academic, state or local election official, or member of the public with particular knowledge of election law, we encourage you to Join the Project. Joining will enable you to contribute annotations to statutory text, make comments on existing annotations, participate in site discussions, and request the addition of supplementary materials. Membership to the site is free, though each request for access requires approval from the Election Law Program. How do I create an eBenchbook for my state? 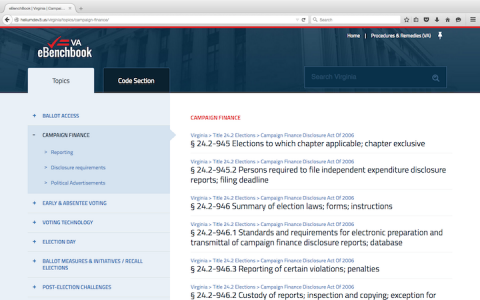 The initial version of the eBenchbook site contains election codes for three states: Colorado, Florida, and Virginia. However, the Election Law Program intends to expand the site’s coverage by incorporating additional state election codes in the future. 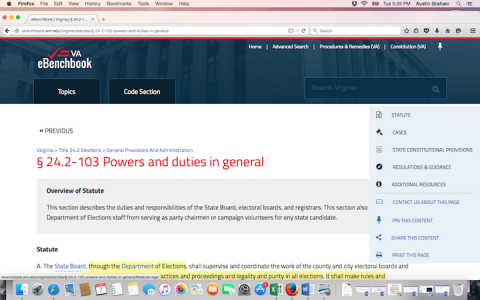 If you are interested in assisting with the addition of your state election code to the site, please contact us.